Make new connections and get to know students outside of your classes! 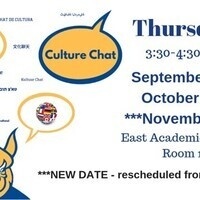 Make new friends, cross cultures and have fun together at the Culture Chat. Featuring hot cocoa, cookies and conversation about winter traditions and holidays. **RESCHEDULED FROM NOV. 15th Snow Day! Sponsored by the Academic Resource Center, International Languages and Cultures Department, English as a Second Language Department, and Multicultural Center and International Student Affairs.